Illusion or reality - an inquisitive thought to ponder! "Illusion" illustrates something that actually does not exist in the visible world; a misapprension, a misinterpretation - my understanding is that it is not real. For instance a mirage, a hallucination - an optical vision which I experience driving on a hot summer day. The visual effects glittering in the distance like a pool of water boiling on the pavement, appears very real yet it is a light reflection. As long as I give my attention, my power to such an illusionary effect, so long this thought creation exists as a reality in my mind. Creation has the appearance of reality and form but it is formless and realityless. The entire universe is an immaterial idea, which seems real but is formless. This is certainly a philosophically exciting concept, which can blow my mind but for the fun of it I let my unlimited ideas soar. Great minds have discussed illusion and reality, realizing that all life is an illusion - a changeable fact which at any time I can alter to any other illusion according to my thought, according to my desire. So as a human being, I am an illusionist playing with illusions while I think that they are real, which of course they are according to my belief. Whatever I think, experience and live by, is a matter of my choice - me playing relative and absolute. I am whole and perfect, I like me, I am divine order, I am peace. I live my perfect divine pattern in my perfect spirit, mind and body. Her concentration was fully on this mental-spiritual training, educating her newly born brain stem cells, rewiring her body, ready for a perfect photograph. The perfect effect was confirmed by her doctor in a second X-ray just a few days later. The brain is an organ of the mind, it allows me to respond to my thoughts, to be molded however I desire it to be. That it works is now proven by scientists, by medical doctors, by metaphysicians, all in one accord. Regardless what my intellect, my senses, my feelings try to persuade me to believe, I tune into my inner realm of quietness where there is neither logic nor reason. My game here on Earth is to REMEMBER that I am a divine being, untouched by the "good" or "bad" illusions of life. My nervous system cannot tell the difference between an actual experience and one that I vividly imagine. So I imagine, I dream, I think, I focus on what I like to be my joy of life. I am the great illusionist, creating whatever is my choice, my pleasure. Just recently I received a series of e-mail-pictures-with perfect illusionary effects. One of them is a street picture showing a hole in the street. 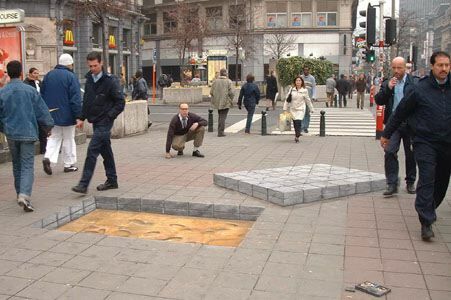 The picture looks so real that people walking by avoid stepping into the hole. 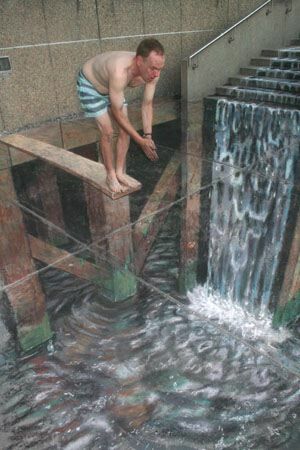 This picture is a three-dimensional painting drawn by a genius street painter giving the public a charming illusionary effect. What is illusion and what is real? My life is my game and what matters is how important it is to me as I am being myself and having fun.